Upon the recommendation of your Regional Sales Manager and the team at MAX Insurance®, your agency has been selected to participate in our Mutual Aid Ministries’ Agent Community Grant Program for 2019 & 2020. Read below for more information about our program. 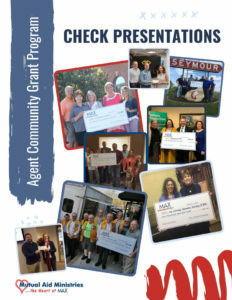 Mutual Aid Ministries created the Agent Community Grant program to help our independent agents become more involved in their communities, and to build stronger relationships between MutualAid eXchange (“MAX”) and its independent agencies. We believe this program exemplifies the fair, faithful and socially responsible way MAX and our agents do business. We hope the program encourages our agents to become more engaged in their communities and to feel a stronger commitment to MAX as the carrier of choice for their clients and prospects. MAX Community Grants are intended to help locally-based charitable or community service causes within the agents’ communities. Grants should be used for specific items, programs or initiatives that directly serve the community and/or the beneficiaries of the project. Recipient charity organizations must be registered 501(c)3 non-profit groups with a charitable, education or religious purpose. Tax ID numbers may be found at https://apps.irs.gov/app/eos. Gifts will not be awarded for political, business, entertainment or other causes which might be considered controversial. MAX and Mutual Aid Ministries reserve the right to deny gift requests it deems inappropriate. Grants issued are first come first serve. Contributions to state, national or international charities or associations unless the purpose is to serve persons or causes within your community; i.e., a gift to the Red Cross following a disaster in your community. Mutual Aid Ministries reserves the right to approve or deny requests based on availability of funds or other circumstances. *The MAX Share Fund, Inc. may be able to assist individuals and families in need. Visit www.MAXInsurance.com/MutualAidMinistries for more information. Have a question? Contact a member of the Mutual Aid Ministries team on our Agent Line at 844-629-2468 or email info@maxinsurance.com.